Our patented formulation. Breastmilk substitute with our unique blend of ingredients. Contains omega-3 LCPs (DHA). Contains GOS/FOS (9:1). Suitable for combination or bottle feeding. Our Patented Formulation Our First Infant Milk developed by combining our blend of ingredients with our unique process Nucleotides, Omega-3 LCPs (DHA) Contains Omega-3 LCPs (DHA) GOS/FOS (9:1) Our blend of Galacto- and Fructo-oligosaccharides Important notice Breastfeeding is best for babies. 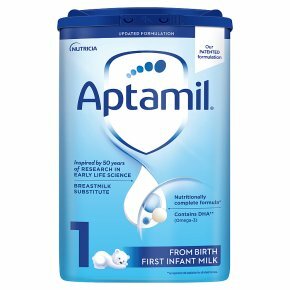 Aptamil® First Infant Milk should only be used on the advice of a doctor, midwife, health visitor, public health nurse, dietitian, pharmacist, or other professional responsible for maternal and child care. Feeding Guide Your baby may need more or less than shown in the table below which is provided as a guide. Consult your healthcare professional if you require more advice. Important: Always use the scoop provided, please note the colour of the scoop in this pack may change from time to time. Approx. age: Up to 2 weeks, Approx. weight 3.5kg, 7 3/4lb, No. of level scoops per feed (1 scoop = 4.6g): 3, Single feed 90ml, 3fl oz, No. of feeds per 24 hours: 6 Approx. age: 2-4 weeks, Approx. weight 3.9kg, 8 1/2lb, No. of level scoops per feed (1 scoop = 4.6g): 4, Single feed 120ml, 4fl oz, No. of feeds per 24 hours: 5 Approx. age: 4-8 weeks, Approx. weight 4.7kg, 10 1/2lb, No. of level scoops per feed (1 scoop = 4.6g): 5, Single feed 150ml, 5fl oz, No. of feeds per 24 hours: 5 Approx. age: 8-12 weeks, Approx. weight 5.4kg, 12lb, No. of level scoops per feed (1 scoop = 4.6g): 6, Single feed 180ml, 6fl oz, No. of feeds per 24 hours: 5 Approx. age: 3-4 months, Approx. weight 6.2kg, 13 3/4lb, No. of level scoops per feed (1 scoop = 4.6g): 6, Single feed 180ml, 6fl oz, No. of feeds per 24 hours: 5 Approx. age: 4-5 months, Approx. weight 6.9kg, 15 1/4lb, No. of level scoops per feed (1 scoop = 4.6g): 7, Single feed 210ml, 7fl oz, No. of feeds per 24 hours: 5 Approx. age: 5-6 months, Approx. weight 7.6kg, 16 3/4lb, No. of level scoops per feed (1 scoop = 4.6g): 7, Single feed 210ml, 7fl oz, No. of feeds per 24 hours: 5 Approx. age: 7-12 months, Approx. weight - kg, - lb, No. of level scoops per feed (1 scoop = 4.6g): 7, Single feed 210ml, 7fl oz, No. of feeds per 24 hours: 3 Preparing your baby's feed Because powdered milks are not sterile, failure to follow instructions may make your baby ill. 1 Wash hands and sterilise all utensils according to manufacturer's instructions. 2 Boil 1 litre of fresh water. Leave kettle to cool for 30 minutes and no longer. Measure the required amount of water (refer to feeding guide) into a sterilised bottle. Be careful of scalding. Do not use artificially softened or repeatedly boiled water. 3 Using the scoop provided, level off the powder with the built in leveller. Do not press/heap the powder. 4 Add the correct measure of powder to the water. Adding too many or too few scoops can be harmful. Cap the bottle and shake vertically and vigorously (for 10 seconds) until the powder is dissolve. Remove cap and replace with a sterilised teat. 5 Cool under running tap. Check temperature of feed. Feed immediately. Important feeding advice Make up each feed as required. For hygiene reasons, do not store made up feeds, discard un-finished feeds as soon as possible, and always within 2 hours. Do not heat feeds in a microwave, hot spots may occur and cause scalding. Never add extra scoops or anything else to your baby's feed. Never leave your baby alone during feeding. Important notice<br>When bottle feeding do not allow prolonged or frequent contact of milk feeds with your baby's teeth as this increases the risk of tooth decay. Ask your healthcare professional or dentist for advice. Make sure your baby's teeth are cleaned after the last feed at night.